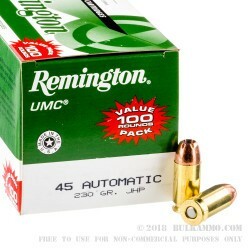 On the upper end of the load spectrum for the quite humble UMC line, this Remington .45 ACP ammo is a good single round selection for the .45 enthusiast out there. 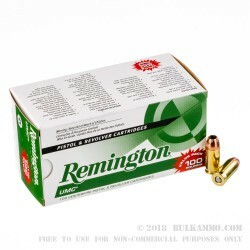 The large 230 grain hollow point and the proven reliability of the load; quality and consistency of the manufacturing process and the relatively clean shooting of this ammunition means it is a fine choice for general all-around carry and range duties. It is not the fastest round in the stable, but it does offer a potent option for those who prefer the 230 grain projectile weight and still want to feel their wallet in their pocket at the end of the day. It has adequate velocity and energy delivery for such a big projectile and can easily be justified as a carry round for those who decide it makes sense for them. An ample 830 feet per second muzzle velocity and 355 ft. lbs. of energy with the heavy bullet makes this an easy to understand load. 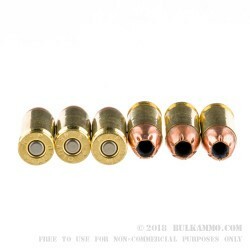 The reliable feeding and extraction come via the slightly rounded tip of the bullet. 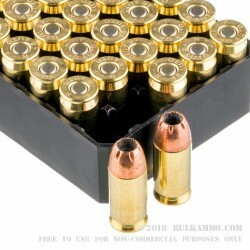 The reloadable cartridge casing and consistent primer means the ammo ignites without difficulty and is easily reloadable for those who want to reload it.